Our February 7th program at the Oak Bluffs Library focused on learning a new skill from the past. Kathleen Peltier (Secretary/Treasurer of the MVMQG) taught participants how to hand-sew a quilt block using the Grandmother’s Flower Garden quilt pattern. 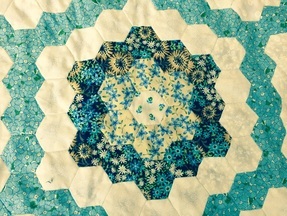 Above right is a piece of Kathleen's quilt-in-progress, comprised of hand-sewn hexagon blocks. The pattern (also known as HoneyComb or Mosaic) dates from the late 1700's. In the early 1920's, the pattern became known as Grandmother's Flower Garden, and it became the most popular quilt pattern of the decade. This is the pattern we used to learn how to hand quilt. Fabric and templates were provided. Many of us -- who had never, ever considered hand quilting -- were hooked! If you would like us to repeat this program in the future please email Kathleen HERE. To download a pdf of Kathleen's instructions, click HERE.